The Sony NEX-FS700 is the clear successor to the Sony NEX-FS100 and it has lot of things going for it. The FS700 can shoot full HD resolution up to 240 fps in short bursts. The internal recording of the FS700 is in the AVCHD format, which gives good results with very long record times. While, it’s a pity that currently 1080/60p footage is a very non-standard format and it’s unsupported in Final Cut Pro 6/7 or FCP X. The 1920 x 1080/60p AVCHD MTS/M2TS full recordings from Sony FS700 can’t be edited by FCP directly via Mac. If you are the Sony NEX-FS700 users and wanna get Sony FS700 60p AVCHD into FCP X/7/6, you will face the AVCHD to FCP importing troubles. 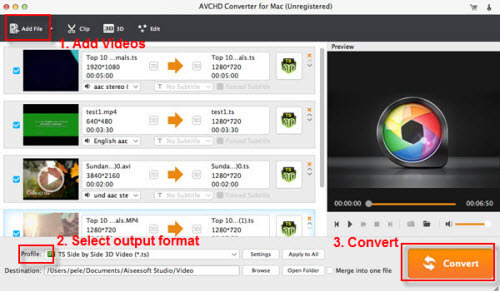 In order to import NEX-FS700 60p AVCHD footage into FCP for smoothly editing, you can use 3rd-party software UFUSoft AVCHD Converter for Mac to re-wrap and convert 60p MTS to Apple ProRes encoded mov format first, which is a native format for Final Cut Pro 6/7/X. It’s a great way to achieve your goal smoothly. For this purose, this article will show you how to transcode Sony NEX-FS700 AVCHD Footage to ProRes MOV in detail. Step 1: Install and run Sony FS700 to FCP Converter from UFUSoft, import Sony NEX-FS700 1080/60p AVCHD files to the converter. Step 2: Click format column and choose best video format for output. To transcode Sony FS700 AVCHD to Apple ProRes format, you can choose Apple ProRes 422. Tip: You can use custom presets for encoding. To do this, click on “Settings” and set video/audio parameters. Before converting Sony NEX-FS700 1080/60p video to FCP Apple ProRes, you can click trim or crop the video by clicking “Clip” button. Step 3: Click on the convert button to convert Sony FS700 AVCHD to ProRes for FCP 6, 7 and FCP X. When conversion finishes, press “Open” to get converted video. 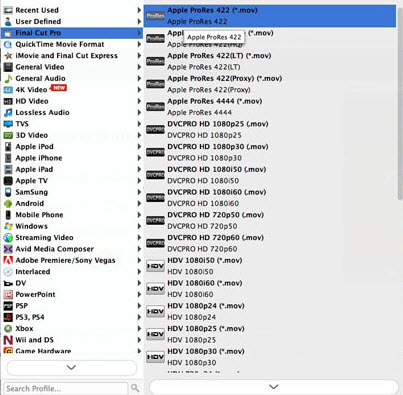 Step 4: Click File –> Import –> Files to ingest Sony NEX-FS700 1080/60p recordings to FCP. Additionally, the Sony AVCHD to FCP Converter can also be helpful in putting MTS/M2TS/AVCHD files to Adobe Premiere Pro, iMovie, FCE etc. If you want to convert Sony AVCHD on Windows, please go to the UFUSoft AVCHD Converter to get more info.